Drink Mix is about mixing as many drinks in a minute. There are different levels of scoring based on how close you mix the drink to the recipe. 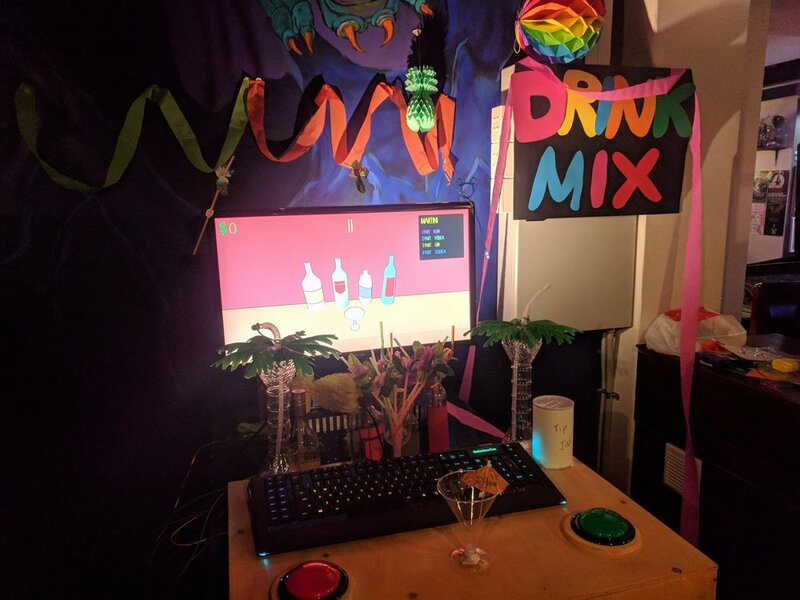 Drink Mix was a project developed by a team of four people (two game designers and two programmers) over 12 weeks at the end of 2017. The project was based on a provided assignment brief which instructed us to make a game that uses a custom made controller that only that game can benefit from. My main roles on the project were project lead and lead programmer. As the project lead I had most of the deciding decisions on the games design and the controller design. I was also in charge of the project budget and all project management responsibilities. As lead programmer my main responsibilities were to get the custom controller working and communicating to the game as well as creating tools to help the game designers with the creation of the game and providing any programming help to the rest of the team. You can download and play the game HERE using a keyboard and mouse. Note, this wont be the intended experience you will get when using the custom controller. You can also browse the game files and view examples of my work on the project HERE. If there are any specific examples of my work I can provide from this project please don't hesitate to contact me through the CONTACT form.